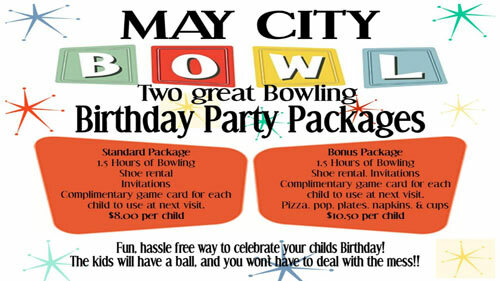 Welcome to May City Bowling Center! Glow Bowling Friday and Saturday Nights! Please call ahead for Open Bowling avail. May City Bowl is located behind Theisens SW. From 30 Exit 30 on to Edgewood Rd going North. Turn right at Williams Blvd SW. Take left on Trent St. SW. Bowling alley is on your left. From 380 Get off on 1st Ave NW going West. 1st Ave turns into Williams Blvd SW. Turn right on to Trent St. SW and bowling alley is on your left.